This study presents an analysis of developments in the qualitative flexibility of the Brussels-Capital Region’s labour market since the start of the 1990s. This form of flexibility was studied simultaneously (rather than alternatively) from the standpoints of the incidences of skill mismatches and job competition between workers with different levels of education ((vertical) job competition) or overeducation on the probability of exiting unemployment for all levels of education. The conclusions reveal that despite the preponderance of mismatches for all levels of education, occupational downgrading has a growing and significant impact for all the higher levels of education, especially during business cycle lows. Boosting low-skilled employment selectively during such lows without boosting employment across the board will reduce the effectiveness of policies to combat the unemployment of people with low skills as high-skilled workers tend to spill over into less skilled employment segments. 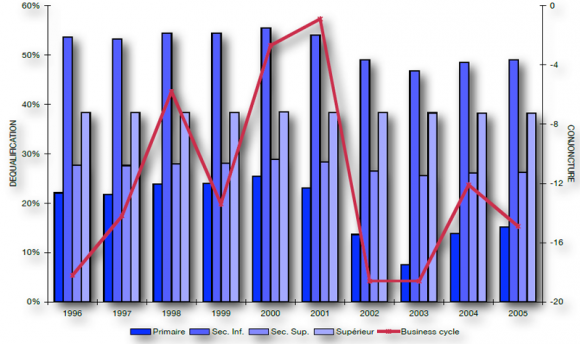 Cette étude présente une analyse des évolutions de la flexibilité qualitative du marché du travail de la Région de Bruxelles-Capitale depuis le début de la décennie 1990. Cette forme de flexibilité a été étudiée simultanément (plutôt qu’alternativement) sous ses aspects relatifs aux incidences de l’inadéquation de qualification et de la déqualification ou sur-éducation sur l’évolution de la probabilité de sortie du chômage pour tous les niveaux d’éducation. Les conclusions mettent en évidence que malgré une intervention majoritaire de l’inadéquation de qualification pour tous les niveaux d’éducation, la déqualification intervient de manière croissante et significative pour les niveaux d’éducation supérieurs et particulièrement en période de basse conjoncture. Une relance sélective de l’emploi peu qualifié non accompagnée d’une relance généralisée de l’emploi conduira en période de basse conjoncture à réduire l’efficacité des politiques de lutte contre le chômage des peu qualifiés par un phénomène de déversement des emplois qualifiés dans les segments d’emplois peu qualifiés. In deze studie worden de evoluties van de kwalitatieve flexibiliteit op de arbeidsmarkt van het Brussels Hoofdstedelijk Gewest sinds het begin van de jaren 1990 geanalyseerd. Deze vorm van flexibiliteit werd in de studie gelijktijdig (veeleer dan alternerend) tegen het licht gehouden van de verbanden tussen onaangepastheid van kwalificaties en de of overkwalificatie enerzijds en de evolutie van de kansen voor alle scholingsniveaus om aan de werkloosheid te ontsnappen anderzijds. Hoewel de onaangepastheid van kwalificaties voor alle scholingsniveaus van doorslaggevend belang is, blijkt uit de conclusies dat de kwalificatie op significante wijze vaker een rol speelt voor hogere scholingsniveaus en dit in bijzonder in periodes van laagconjunctuur. Selectieve relancemaatregelen voor weinig geschoolde tewerkstelling die niet begeleid worden door een veralgemeende relance van de werkgelegenheid leidt in periodes van laagconjunctuur tot verminderde efficiëntie van de werkgelegenheidsmaatregelen voor laaggeschoolden, aangezien er een verdringingsfenomeen optreedt van gekwalificeerde arbeidskrachten in weinig gekwalificeerde werkgelegenheidssegmenten. 1Unemployment is generally greatly differentiated by the level of qualification of the people who access the labour market (De la Croix et al., 2002) and examination of the different regional entities shows that the lower the level of education, the higher the unemployment rate. This study proposes an analysis of the incidence of occupational qualifications on the labour market from two particular standpoints. The first one takes account of the skill mismatch, which is seen by a loss of effectiveness in the matching process, while the second one considers the existence of despecialisation or occupational downgrading phenomena ((vertical) job competition) in which the link between training and employment is weakened by a gradual desegmentation of the labour market that leads to a drop in the probability of unskilled workers’ being able to access the labour market. The aim of this study, which consists of a theoretical part and an empirical part, is to explain to what extent these phenomena can explain the growing gaps in the unemployment rates by level of qualification. 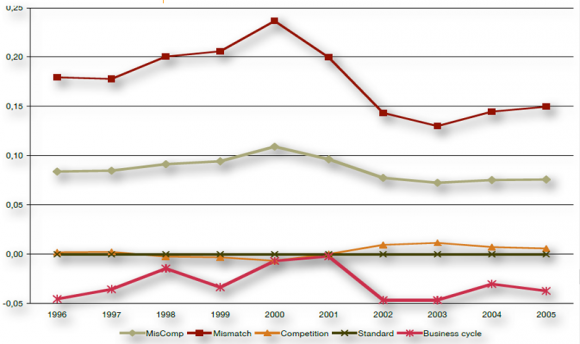 2The theoretical part is based on a matching model adapted to allowing for the various forms of skill-based labour market segmentation that allows the simultaneous analysis of skill mismatches and job competition, which until now had been considered to be competing phenomena (Dejemeppe et al. 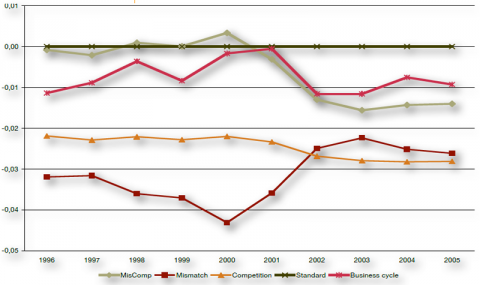 2000).1 The empirical part describes the findings for the Brussels-Capital Region based on statistical indicators of skill mismatch and job competition. This part tries to explain the specific situation of the Brussels labour market, which must deal with high unemployment amongst its low-skilled residents. The study will show that, depending on the labour market’s general situation, sectoral policies are not always the most suitable, given the simultaneous occurrence of skill mismatches and job competition (Devillé 2005). The second section of this study will describe the conceptual framework, the third will present the theoretical model in connection with different labour market segmentation assumptions, the fourth section will present the model’s outcomes, and the last section will present some conclusions and recommendations. 3Two mechanisms that are not mutually exclusive can explain the widening gaps between unemployment rates by level of education that we analyse when looking at qualitative or functional flexibility. The first mechanism attributes the changes in the unemployment rate to a structural rise in the mismatch between the skills offered and required on a highly segmented labour market. This mechanism, which is called a skill mismatch or distortion of qualifications, will lead to tightness in the labour market despite the persistence of high overall unemployment due to the lack of worker mobility between skill (or job qualifications) segments. The second mechanism attributes the changes in the unemployment rate to a generalised lack of demand for labour accompanied by low-skilled workers’ being crowded out of their segments by more skilled workers due to greater mobility between the skill segments on the labour market. This job competition or overeducation will lead unemployed skilled workers to apply for jobs in segments requiring lower qualifications and thus to fill jobs that require lower levels of skill or formal qualifications than they have achieved (the “ladder effect”). 4The higher tech revamping of production has generated a noticeable improvement in technical progress and the creation of new high-skilled jobs, whereas the restructuring or abandonment of more traditional technologies that have become too costly and more open to competition has resulted in the destruction of many low-skilled jobs. The lack of downward wage flexibility, especially for low-skilled labour, has moreover contributed greatly to worsening the phenomenon of the substitution of capital for labour where the skills requirements of the new jobs that are created cannot be met by low-skilled workers who end up in unemployment as a result of the restructuring of traditional technologies (Bean et al. 1990). As a result, persistent unemployment with large structural components has gradually taken root (Layard et al., 1990; Jackman et al., 1990). 5The drop in the demand for low-skilled workers can also be explained by other factors, such as de-industrialisation, the growth of the service sector (tertiarisation), the growth of productivity, and competition from low-wage countries. These structural developments have unfortunately not been accompanied by sufficient training or wage adjustment efforts on the lower rungs of the wage scale, efforts that would have made it possible to maintain the low-skilled workforce’s employability (Snees sens, 1997; Sneessens et al., 1999; Sneessens & Metha, 1995, 2000; Sneessens & Nicolini, 2005; Van der Linden, 1997; Van Haeperen, 2001). Analysis of the labour market consequently reveals major sectoral tightness by level of qualification, the degree of which differs greatly between regions in line with the differences in their production structures’ sectoral make-ups. As a result, businesses may have hiring problems for certain skilled jobs despite the persistence of widespread overall unemployment because the low-skilled unemployed cannot vie for the new jobs that are created due to their lack of qualifications (Van Haeperen, 2005). 6In a situation of a general lack of job vacancies, skilled workers who cannot find jobs in their skill segment apply for jobs in a lower skill segment, where they compete with the workers in this segment. The latter will then in turn have the possibility of aiming for jobs on a lower rung of the ladder. The result is a ladder effect in job competition down to the lowest skill segment, where unskilled workers find themselves competing with more skilled workers without having the possibility of turning to another skill segment and are forced either to go on unemployment or to withdraw from the labour market altogether. At the top of the ladder, the workers who accept to downgrade their skills level increase the probability of finding work, for they face no competition from more qualified workers in their own segment. At the bottom of the ladder, the probability that unskilled workers will find jobs decreases. In the middle rungs, occupational downgrading or “vertical job competition” is an interesting strategy for the segment’s worker if the probability of finding employment in the lower segment is greater than the decrease in the probability of finding a job in her/his own segment due to competition from more highly-skilled workers (Green et al., 1999; Hartog, 2000; Van Hoof, 1996; Denolf et al., 1996, 1999; Simoens et al., 1997 1998). This phenomenon, which results from a mismatch between the labour supply and demand, is primarily a short-term phenomenon. 7From the employer’s standpoint, it may seem worthwhile to hire an over-skilled worker for the same wage as a worker who has the requisite level of qualifications for the job to be filled if the employer can avoid future training expenses. However, the employer may be reluctant to invest in an over-qualified worker who, if s/he fails to get an in-house promotion, may try to leave the firm for better employment opportunities in her/his own segment. From the worker’s standpoint, accepting an under-skilled job is a way to avoid unemployment in the short run, but makes her/ him less available for searching for work in her/his own segment. Filling an underskilled position for a long period of time will ultimately result in the worker’s losing some of the qualifications that s/he acquired in her/his initial segment. This situation is likely to be a negative signal for a future employer if this downgrade is interpreted as reflecting the worker’s inability to be hired in her/his initial skill segment. The transition to a job matching her/his initially acquired qualifications then becomes more difficult in the long run (Dejemeppe et al., 2000). In the long run, however, the supply of and demand for skills tend to meet each other, either through the adaptation of the less skilled job towards higher levels of skill and pay or, in the case of the generalised resurgence of demand, through the worker’s departure for a more skilled and better paid job in her/his initial skill segment (Dolton & Vignoles, 2000; Hartog, 2000; Green et al., 1999). 8I shall distinguish different skill segments i = 1,..n, and the matching function2 3.1 from Table 3.1 for skill segment i, where Xit is the number of hirings in segment i at time t, Sit, is the number of jobseekers applying for jobs in segment i, Vit is the number of vacancies requiring the skill level i, α and β (> 0) are the parameters of the matching function, and k is the efficiency of the supplier-jobseeker meeting process, which is assumed to be identical for all the skill segments i. This process k = φ (Ag, Tu) depends primarily upon the length of the unemployment, Tu, and the jobseeker’s age, Ag. 9Let us consider a situation characterised by imperfect labour market segmentation where the unemployed with skill level i, Ui, can offer their labour in their own and a less skilled segment.3 Moreover, vacancies requiring skill level i, Vi, may be filled by unemployed people from this segment and overeducated unemployed workers from the skill segment immediately above it, i+1. All of the unemployed are searching for work in their own segment i and a fraction λi of them are also investigating opportunities in the segment immediately below it, i‑1, at the same time. The supply for segment i, Si, is not, however, the simple sum of the unemployed in this segment, Ui, and a fraction of the unemployed people in the higher segment λi+1Ui+1, because the latter have a greater likelihood of getting job offers on level i. We shall thus assign a relative efficiency parameter δi > 1 to the overeducated unemployed so as to weight their proportion λi in level i’s supply Si4. However, it will not be possible to identify parameters δi and λi separately from the data in our possession. Only the aggregate parameter γi = δi.λi will be identifiable in the model in Table 3.1. The number of jobseekers applying for jobs in segment i will then be determined by applying Equation 3.2. Similarly, the number of vacancies filled by unemployed workers from level i, Zi, is the sum of the vacancies filled in segment i, Yi and in segment i-1, Yi-1, weighted respectively by the proportions of unemployed workers in the total number of jobseekers in these segments, as shown by Equations 3.3.a-c.
10The probability of level i jobseekers’ exiting unemployment is then expressed by Equation 3.4. I shall also consider a variable tightness indicator5 across the skill segments Vit/Uit that characterises the state of the labour market in segment i. This indicator is linked to the overall labour market tightness indicator Vt/Ut by Equation 3.6, where ηi is a parameter that represents the coefficient of labour market tightness in skill segment i. If we substitute Equation 3.5 into Equation 3.4, the probability of level i jobseekers’ exiting unemployment is expressed by Equation 3.6.a, and if the expression 3.2 is substituted into Sit and Si-1t, Equation 3.6.a can be rewritten in its simplified form 3.6.b. 11The model shown in Table 3.1 makes it possible to measure the phenomena of skill mismatches and job competition simultaneously instead of alternatively (Dejemeppe et al, 2000) in line with the differentiation of skills and business cycle conditions. It is nevertheless possible to isolate each phenomenon using specific parametric constraints and to measure the effects of these constraints on the model’s behaviour. This makes it possible to reveal the relative incidences of skill mismatch and job competition on the probability of exiting unemployment. 12In this section we shall try to identify simultaneously from the data in our possession the skill mismatch phenomenon and the ladder effect in job competition in order to determine their relative importance. This is of vital importance if one considers that economic policy recommendations will differ according to the phenomena that are identified. 13The skill mismatch comes from a technological bias against low-skilled labour and suggests that employment potentials at lower skill levels should be preserved by tax incentives or policies that act selectively on the cost of low-skilled labour as well as to improve the low-skilled workforce’s level of education through labour supply training policies. The ladder effect comes from a generalised scarcity of jobs accompanied by low-skilled workers’ being crowded out by more skilled workers and suggests the need to boost employment non-selectively through government spending policies or tax and monetary polices aimed at economic expansion. 14The empirical study was carried out using the Brussels job placement agency ACTIRIS data in the STAT 92 socio-economic database concerning job offers received and filled in the course of the year and data about unemployed jobseekers for the Brussels-Capital Region (annual means, 1996‑2005) in the STAT 93 database. 15These job supply and demand statistics are disaggregated by level of education, as ascertained by the last degree earned by the individual in her/his academic career. For this model, four levels of education were used, to wit: primary education (or no schooling), lower secondary education, upper secondary education, and higher education (short courses, long courses, and university degrees). However, these data do not allow one to account for the occupational skill that has been acquired through years of work experience, thereby introducing a skills bias that is proportionate to the individual’s age. This dimension, which might be tackled by the years of service in the performance of a job, cannot be captured validly by the available data. So, the level of school education was the only parameter that could be used to measure skill acquisition. an under-estimation bias linked to a demand for a skill level above the level required so as to filter the best applicants. 17In addition, the announcements placed with the job placement agency account for only a small proportion of the vacancies on the market, and positions requiring a low level of education are most likely over-represented in them and strongly correlated with the business cycle. The data used are annual and concern exclusively the job announcements posted with the job placement agency. These announcements include private job announcements and offers linked to various employment promotion policies. 18Although this statistic is subject to caution, the starting parameters estimated from it (prior information) will be corrected during the simultaneous estimation, which will make it possible to determine the proportions of the two phenomena going into the explanation of the probability (a posteriori) of exiting unemployment by level of education (see Annexe 1 for the details of the model’s estimations). 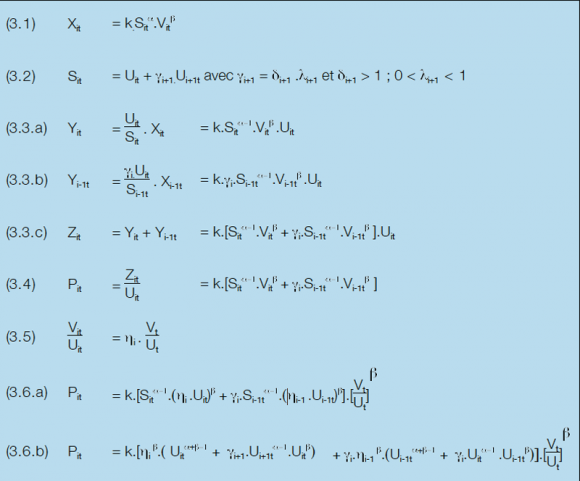 19The outcomes of the simultaneous full information maximum likelihood estimation of all of the parameters of the complete mismatch and competition model shown in Table 3.1 are given in Table 4.1 below. 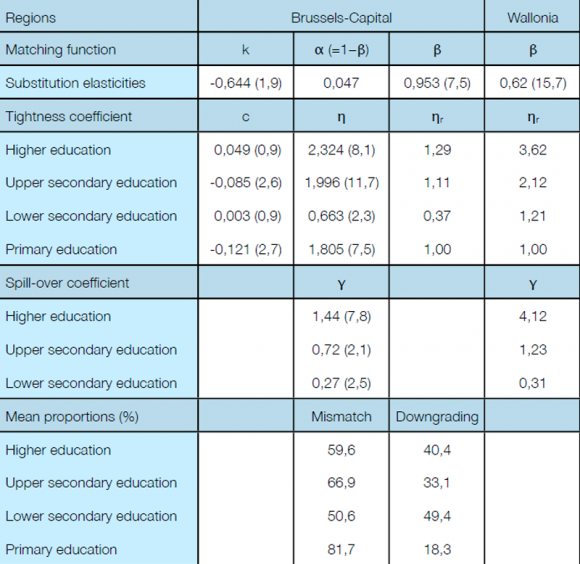 Comparison of the Brussels-Capital and Walloon Regions. 20The tightness coefficient ηi increases with rising level of education, with the exception of the lower secondary level, where it is particularly low (0.66) and markedly less significant. In relative terms, the coefficients ηri are measured with respect to the primary level of education (ηrp = 1) and reveal a rising tightness with the required level of education. This has a positive effect on the probability of exiting unemployment and explains the disparities in this probability across the skill segments, as we shall see subsequently. This tightness is, however, half as high in the Brussels-Capital Region as in the Walloon Region for all the levels of education considered. 21The low tightness seen for the lower secondary level most likely results from the small number of job vacancies compared with the number of jobseekers for this level of education, which is not very popular. The common trend in the state of the labour market is measured by the ratio Vt/Ut, which has been characterised by a falling trend since the start of the period. 22The spill-over coefficient γi likewise rises with the level of education. This coefficient practically doubles in going from lower to upper secondary education and then again from the upper secondary level to higher education (tripling in the Walloon Region). Competition between the skill levels is thus more intense in the higher levels and gradually falls off as one nears the primary school level, where the spill-over of jobseekers from the lower secondary school level does not seem to compete significantly with the jobseekers with primary educations, as emphasized by the gaps between the probabilities of exiting employment for these two levels of education that will be shown below. 23The mean proportions of the phenomena of skill mismatch and downgrading that enter into the explanation of the probability of exiting unemployment of the complete mismatch-competition model (Equation 3.6.b in Table 3.1) shows a predominance of the mismatch phenomenon for all the levels of education; a slight predominance for the skilled levels that is however greater for upper secondary education (67%) than for higher education (60%); a quasi-equality of the two phenomena for lower secondary education (51%); and a strong predominance of mismatching for primary education (82%). 24This section presents the probabilities of exiting unemployment that the mismatch-competition model computes for the various levels of education. By imposing different parametric constraints on the model we can reveal the relative incidences of the skill mismatch and job competition effects on the probabilities of exiting unemployment according to the level of education. 25Graph 4.1 below reveals that all of the levels of education are sensitive to the business cycle, albeit with growing disparities in the probabilities’ trends according to the level of education and economic situation. So, during a boom in the cycle (2000 and 2004), the probability of exiting unemployment increases with increasing level of education, whereas during low points (1999, 2003, and 2005), the changes in this probability are quite comparable across the four education categories. This underscores the asymmetrical effects of the business cycle on the probability of exiting unemployment according to level of education. Higher education, for which the tightness coefficient, ηsp, is the largest (2.3), thereby boosting the probability of exiting unemployment. The spill-over coefficient, γsp, is also the largest for this level (1.4), which raises the probability of exiting unemployment even more given that this level of education does not have to fear competition from a higher level. The phenomena of skill mismatch and job competition reinforce each other’s effects for this level of education, which explains the markedly higher values of the probability of exiting unemployment for higher education. Primary education, for which the tightness coefficient, ηpr, is smaller (1.81) than for the upper secondary (1.99) and higher education (2.32) levels, thereby limiting the rise of the probability of exiting unemployment. Downgrading is impossible for this level of education, which nevertheless faces competition from the lower secondary education level. 27This last effect reduces the probability of exiting unemployment for the primary level. The effects of mismatches on the primary level and job competition on the lower secondary level counteract each other and only the net effect is to be taken into consideration in terms of the changes in the probability of exiting unemployment. This explains this probability’s markedly lower value for this level of education. The upper secondary level of education has a smaller tightness coefficient, ηss, (1.99) than that of higher education (2.32), meaning a more limited positive impact on the probability of exiting unemployment. 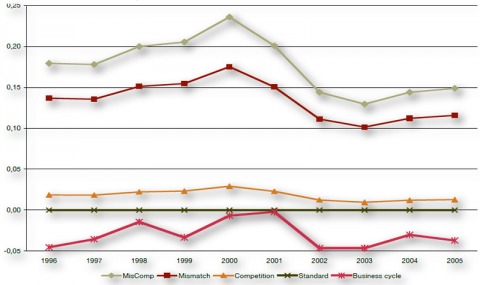 Its spill-over coefficient, γss, is also smaller (0.72) and this level also faces competition from the higher education level. The net effect on the probability of exiting unemployment will thus be smaller for this level of education than for the one above it. The effects of skill mismatches and job competition will reinforce each other, but less strongly in each direction than for the higher level. This explains the smaller value of the probability of exiting unemployment for this level of education than for the one above it (higher education). The lower secondary level of education has the smallest tightness coefficient, ηsi, (0.66) of all the levels of education, meaning the smallest impact on the probability of exiting unemployment of all the levels of education. The workers with lower secondary educations, for whom the spill-over coefficient, γsi, is also the smallest (0.27), compete only marginally with workers with primary school educations or without school-leaving certificates, whereas they are subject to stiff competition from upper secondary school graduates (whose spill-over coefficient γss, at 0.72, is more than double theirs). The net effect of their competing for jobs on a lower level thus also has a negative impact on the probability of exiting unemployment, which is compounded by that of the tightness effect, thereby leading to a lower probability of exiting unemployment for the lower secondary than for the primary education level. This may seem counterintuitive at first glance. However, this atypical behaviour of the lower secondary education level can be explained by the fact that for such lowskilled levels, employers prefer unskilled workers, whom they can pay less than overqualified workers, who will be scarcely more operational than primary school graduates but demand higher wages. 29In this section we shall analyse the respective contributions of skill mismatches and job competition on the formation of the probability of exiting unemployment by level of education. To this end, we shall consider the reference version of the complete model6, where the tightness parameter ηi is set at 1 and the spill-over parameter γi at 0 for all of the levels of education so as to annihilate the effects of the tightnesses and spill-overs on the probability of exiting unemployment. I shall then show the probability deviations resulting from different positions of these parameters compared with the reference model so as to be able to isolate the effects of skill mismatching and job competition within the mismatch-competition model as a whole. 30Graph 4.2 shows the deviations in the probability of exiting unemployment from the reference model (no tightness and spill-overs) for the primary education level. 31We can see that the presence of tightness on the labour market that calls upon the primary education level (ηpr = 1.8) increases the probability of exiting unemployment compared with the reference model in line with changes in the business cycle. This probability increases by 16% during the 2003 crest and by only 9.4% during the 2003 trough. 32Workers with primary school educations face job competition from lower secondary school graduates with no possibility of downgrading their status. This situation leads to a drop in their probability of exiting unemployment compared with the reference model. Moreover, this drop is also dependent on the business cycle, falling by 2.3% during the 2000 crest and by 0.25% during the 2003 trough. 33Graph 4.3 shows the deviations in the probability of exiting unemployment from the reference model for the lower secondary education level. 34Unlike the other levels of education, this level is less tight than the primary education level (ηsi = 0.66). Consequently, taking account of the phenomenon of a skill mismatch leads to a decrease in the probability of exiting unemployment for this level compared with the reference model that increases as the business situation improves (-4.3% in 2000 versus -2.25% in 2003). 35When it comes to job competition, the negative effect on the probability of exiting unemployment that is linked to competition from the upper secondary education level prevails over the positive effect that is linked to downgrading towards the primary education level, so that the net effect of the ladder effect on the probability of exiting unemployment will also be negative throughout the period, with an exacerbation of this effect linked to the low point in the business cycle at the end of the period (-2.8% in 2003 versus -2.2% in 2000). 36As the two effects are mutually anticyclic, they annihilate each other partially and the net effect will change the probability of exiting unemployment compared with the reference model only slightly, so that it will become positive during peaks in the economic cycle (0.1% in 1998 and 0.33% in 2000) and remain negative throughout the rest of the period, especially during the low points at the end of the period (-1.6% in 2003). 37Graph 4.4 shows the deviations in the probability of exiting unemployment from the reference model for the upper secondary education level. 38This level has a higher relative level of tightness than the primary education level (ηss = 1.99). Consequently, the skill mismatch phenomenon leads to a greater incmrease in the probability of exiting unemployment compared with the reference model than for the primary education level in line with changes in the business cycle (23.7% during the 2000 peak and 13% during the 2003 trough). 39When it comes to job competition, unlike the case for the primary education level, the net effect is slightly positive during the business cycle lows at the start and end of the period (1.15% during the trough of 2003), for the increase in the probability that is linked to occupational downgrading prevails over the decrease in probability linked to competition from the higher education level during these periods. 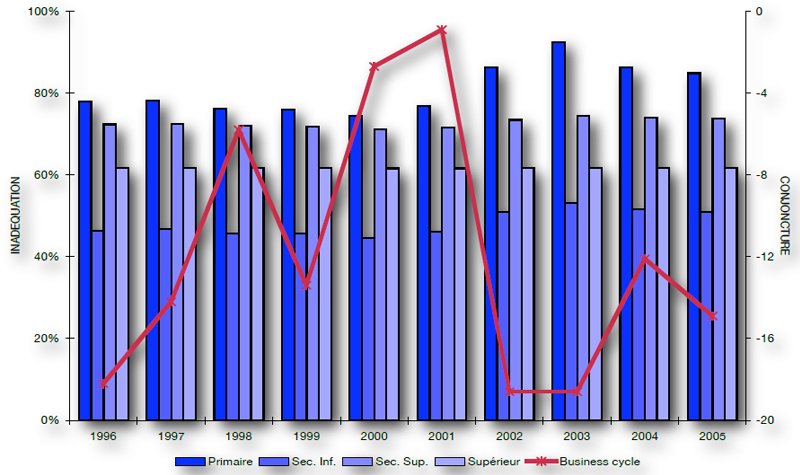 The net effect is negative throughout the rest of the period, especially during the business cycle peak in 2000 (0.66%), for the drop in the probability that is linked to competition from the higher level prevails this time over the rise in the probability that is linked to downgrading during this period. 40Despite the fact that the effects of skill mismatch and job competition are additive during business cycle lows and counter each other during high points in the economic situation, the probability of exiting unemployment increases more strongly compared with the reference model situation during the peak situation of 2000 (11%) than during the lows (7.25% in 2003). During the economic peak of 2000, the probability increased greatly under the major pressure of the positive effect of the skill mismatch (23.7%) despite the negative effect of job competition (-0.66%), whereas during the low point of 2003, the probability increased more moderately, under the more limited pressure of the skill mismatch’s positive effect (13%), despite the more marked positive effect of job competition (1.15%). 41Graph 4.5 shows the deviations in the probability of exiting unemployment compared with the reference model for the higher education level. 42When it comes to the skill mismatch, the tightness that appears in the market regarding the higher education level increases the probability of exiting unemployment over the reference model’s value less strongly (17.5%) than in the upper secondary education segment (23.7%), despite a larger tightness coefficient (ηsu = 2.3 versus ηss = 1.99). This may be due to a greater heterogeneity of skills, which would reduce mobility within this segment and consequently the tightness coefficient’s effect on the probability of exiting unemployment. 43When it comes to job competition, the effect is positive throughout the period and more strongly so than for the preceding education levels (2.9% for the higher education level versus 0.66% for upper secondary education and -2.2% for lower secondary education in 2000), for this level of education is not subject to competition from a higher level. 44The two effects are superimposed on each other in this case and the probability of exiting unemployment compared with the reference model is markedly higher than for the other levels of education (23.6% for higher education versus 10.9% for upper secondary education7 and 10.6% for primary education in 2000). The deviation is practically double that of the upper secondary level and increases with improvement in the business cycle (2.2% in 2000 versus 1.8 in 2003). 45Graphs 4.6 and 4.7 below show the proportions of the probability of exiting unemployment by level of education that are explained by the phenomena of skill mismatch and job competition, respectively8. 46Graph 4.6 above shows that the proportion of skill mismatch is predominant in explaining the probability of exiting unemployment for all the levels of education. However, its impact declines with increasing level of education (except for the atypical case of lower secondary education, where it is close to 50%) and its business cycle sensitivity is anticyclic and likewise decreases with increasing level of education. The skill mismatch proportion thus tends to become more structural as one moves towards higher levels of education (upper secondary and higher education). 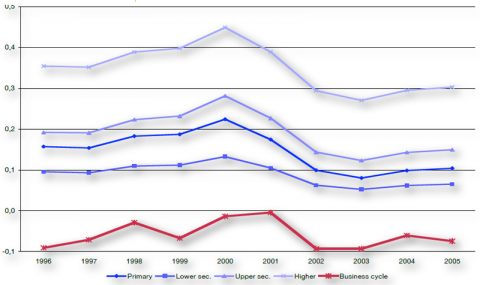 47The complementary proportion of spill-over (the “ladder effect”) shown in Graph 4.7 below plays an increasing role with increasing level of education and its sensitivity to the economic situation is procyclic and decreases with increasing level of education. 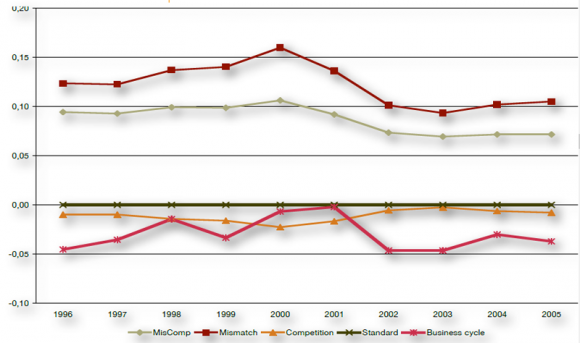 The proportion of job competition from above has a significant impact for the higher education level and the atypical lower secondary level. 48This study involved an attempt to include the skill mismatch phenomenon and ladder effect9 in one model to explain the probabilities of exiting unemployment of several categories of jobseekers with different levels of education. 49The biases that a number of other studies have documented (Dejemeppe, Cockx, & VanderLinden, 2000; and Van Haeperen, 2005) also apply to the ACTIRIS data that feed the STAT 92 database and concern the qualifications that employers require in their job announcements. These biases either over-estimate the qualifications that employers require to fill job vacancies, according to certain approaches, in order to select the best applicants, or under-estimate them, according to other approaches, in order to keep salaries down. 50The assumption here was that the two approaches could offset each other and the “prior” information collected in this way would be corrected a priori by the complete model’s simultaneous estimations. This assumption then made it possible to identify the two phenomena and to include them in a model that could adjust endogenously the two phenomena’s proportions in the explanation of the variance of the probability of exiting unemployment for the various education levels considered. 51The economic literature acknowledges the co-existence of a structural skill mismatch revealing a technological bias against the less skilled or educated workers and job competition (occupational downgrading) that has an anticyclic component that increases during periods of recession and a structural component linked to imperfect information about the match between jobseekers’ profiles and the jobs to be filled on the labour market. However, the literature remains divided as to the relevance of job competition compared with the structural skill mismatch in explaining the rising trend of unemployment among the least skilled workers. These factors are usually attributed to market imperfections and asymmetries in the information held by employers and workers that cause poor matches, the effects of which can persist for the medium term. 52The model put forward shows that, although the skill mismatch has a preponderant role in explaining the probability of exiting unemployment for all the levels of education, job competition has a rising and significant role for the higher levels of education. 53This finding has consequences for short-term economic policy recommendations. The selective boosting of low-skilled jobs can be achieved by policies acting upon the cost of this labour or by tax stimuli aimed at keeping pockets of low-skilled employment in the region. These policies must nevertheless be accompanied by general employment support policies during periods of recession in order to limit the ladder effect in job competition, which puts an additional squeeze on the less qualified jobs during such periods. 54Now, this type of job is far from negligible in the BCR. We effectively see that in 2005, for example, 67% of unemployed jobseekers registered with the Brussels job placement agency ACTIRIS had lower secondary, primary school, or no education whereas only 33% had higher levels of education: 21% moderately educated (upper secondary school graduates) and 12% highly educated (higher education graduates). 55In the longer run, we can suppose that this component is adjusted by an upgrading of the tasks that are required of over-qualified personnel or by the latter’s redeployment in higher-level jobs. The general job structure is thus redefined in favour of this type of job. 56Whether the surplus supply of low-skilled labour results from a technological bias on the demand side or a recomposition of the labour supply through the ladder effect in job competition, employment policies can act only on maintaining pockets of low-skilled employment in the short run and increasing the mean level of education of the labour supply in the longer run. This would make it possible to develop and expand new activities requiring more skills and qualifications, especially in the business services, communications (NITC)10, and financial services sectors, which tend to concentrate more in urban areas such as the Brussels-Capital Region. ACTIRIS & Observatoire Bruxellois du marché du travail et des Qualifications, Analyse des fonctions critiques en région de Bruxelles-Capitale 1998‑2002, 1999‑2003, Bruxelles. BEAN, C., C.A PISSARIDES, “Skill shortages and Structural Unemployment in Britain: A (Mis)matching Approach”, in PADOA-SCHIOPPA, F., ed., Mismatch and labour mobility, 1990, Cambridge University Press. DE LA CROIX, D., F. DOCQUIER, C. MAINGUET, S. PERELMAN, E. WASMER, Capital humain et dualisme sur le marché du travail, dans Economie, société, région, Collection du Service des Études et de la Statistique du Ministère de la région wallonne, 2002, De Boeck & Larcier, Bruxelles. DEJEMEPPE, M., B. COCKX, B. VAN DER LINDEN, “Déqualification en cascade ou inadéquation des qualifications en Belgique ?”, Analyse économique et prévisions, septembre 2000. DENOLF, L., J. DENYS, Les entreprises et le recrutement en Belgique en 1995, 1996, Upedi, Bruxelles et Hoger instituut voor de arbeid, Leuven. DENOLF, L., J. DENYS, P. SIMOENS, Les entreprises et le recrutement en Belgique en 1998, 1999, Hoger Instituut voor de arbeid (HIVA), Katholieke Univ. Leuven. DEVILLÉ, H., Nouvelles technologies et chômage structurel, 2002, L’Harmattan, Paris. 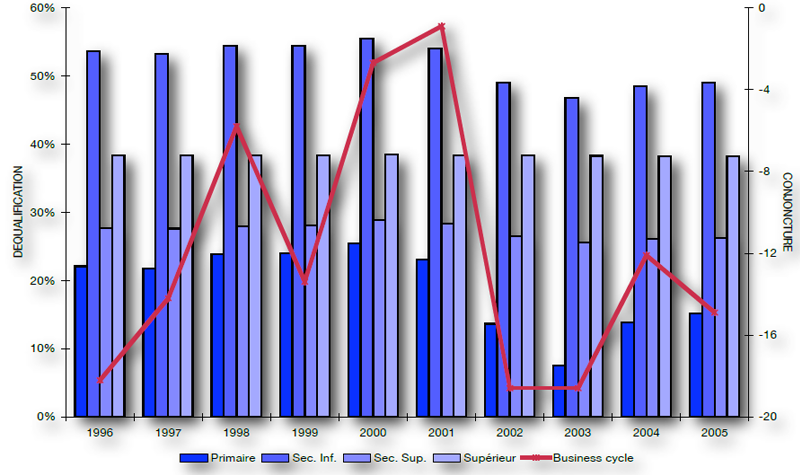 DEVILLÉ, H., “Évolutions de la flexibilité de différentes formes d’emplois dans la région de Bruxelles-Capitale”, Cahiers économiques de Bruxelles, 48 (2005) 355‑391. DEVILLÉ, H., Evolution récente des structures et de la flexibilité des emplois dans la région de Bruxelles-Capitale, Iris éditions Dossier No. 41 (2005). DOLTON, P., A. VIGNOLES, “The incidence and effects of overeducation in the U.K. graduate labour market”, Economics of Education Review, 19 (2000) 179‑198. GREEN, F., S. MCINTOSH, A. VIGNOLES “Overeducation and skills-Clarifying the concept” Center for Economic Performance (1999), London School of Economics and Political Science. JACKMAN, R, LAYARD, R., S. SAVOURI, “Labor Market Mismatch: A Framework or Thought”, in PADOA-SCHIOPPA, F., ed., Mismatch and labour mobility, 1990, Cambridge University Press. LAYARD, R., NICKELL, S., R. JAKMAN, “Unemployment, Macroeconomic Performance and the Labor Market”, 1991, Oxford University Press. HARTOG, J., “Overeducation and earnings: where are we, where should we go?”, Economics of Education Review, 19 (2000) 131‑147. PETRONGOLO B., C. A. PISSARIDES, “Looking into the Black Box: a survey of the Matching Function”, Journal of Economic Literature, Vol. 39 (June 2001) 390‑431. PISSARIDES C. A., Equilibrium Unemployment Theory, 2nd ed., 2000, MIT Press, Cambridge MA. 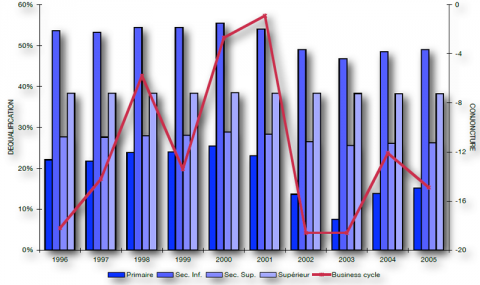 SIMOENS, P., J. DENYS, L. DENOLF, Les entreprises et le recrutement en Belgique en 1996 et 1997, 1997‑98, Upedi, Bruxelles et Hoger instituut voor de arbeid, Leuven. SNEESSENS, H.R., “Les causes du chômage: première analyse”, in VAN DER LINDEN, B., ed., Chômage. Réduire la fracture, 1997, De Boeck-Université, Bruxelles. SNEESSENS, H.R., F. METHA, “Emploi et chômage”, In Que nous est-il arrivé ? Un demi-siècle d’évolution de l’économie belge, 2000, Reflets et Perspectives de la vie économique. SNEESSENS, H.R., R. NICOLINI, F. METHA, “Innovations et chômage en région wallonne ; aspects économiques”, 2005, Reflets et Perspectives de la vie économique. VAN DER LINDEN, B., ed., Chômage : réduire la fracture, 1997, De Boeck-Université, Bruxelles. VAN HAEPEREN, B., “Formes d’emploi et flexibilité du marché du travail : évolutions récentes en Belgique”, Cahiers économiques de Bruxelles, 172, 1° trimestre, (2001) 89‑132. VAN HAEPEREN, B., “Formes d’emploi et durée du travail : Évolution comparée de la Belgique, de ses région et des pays voisins au cours de la période 1992‑2002” Discussion Papers Institut Wallon de l’Évaluation, de la Prospective et de la Statistique (IWEPS) No. 0403, 2004. VAN HAEPEREN, B., “L’appariement sur le marché du travail en Wallonie ; estimations empiriques sur la base de données infra-régionales” Discussion Papers Institut Wallon de l’Évaluation, de la Prospective et de la Statistique (IWEPS) No. 0503 Août 2005. VAN HOOF, K., “Is er verdringing op de Vlaamse arbeidsmark?”, Steunpunt WAV, Nieuwsbrief 3, (1996). Before going ahead with an estimation of the complete model integrating skill mismatch and job competition simultaneously, we shall estimate the two phenomena separately11. The empirical findings are given in Table 1 below. 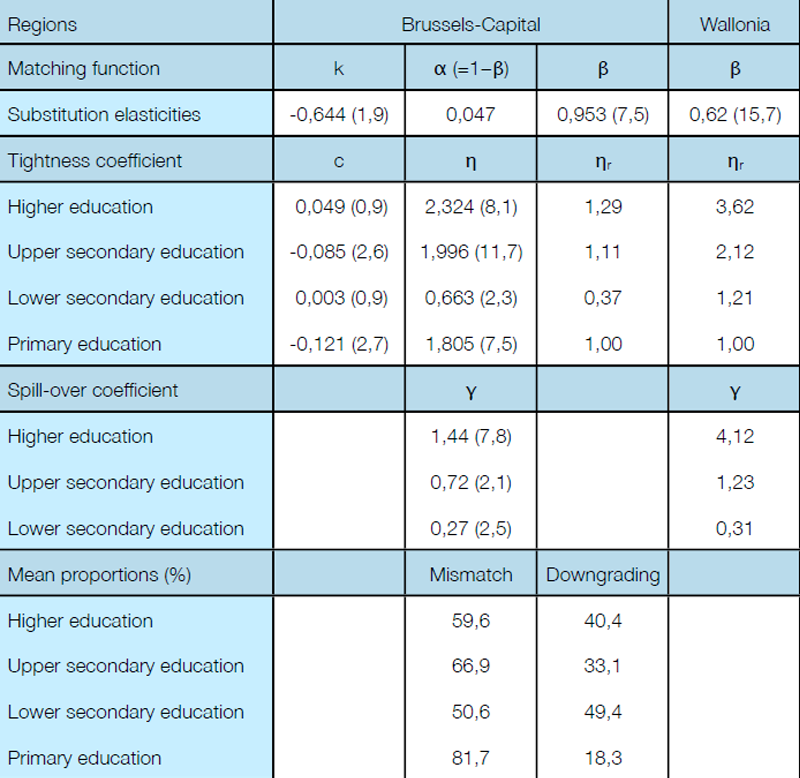 This table compares the elasticities12 with respect to jobseekers, α, and job vacancies, β, by level of education and for the entire Brussels-Capital Region. These elasticities are then compared with those of the Walloon Region and Kingdom of Belgium as a whole. The elasticity with respect to job vacancies is particularly high in the Brussels Region (0.95) and contrasts with that of the Walloon Region (0.62), although the latter is still above 0.5, and that of the Kingdom (0.4), which is closer to those of most European countries (0.3). This high elasticity attests to the fact that hirings in Brussels depend primarily on the job vacancies that businesses announce, which make up the short side of the market and are relatively independent of the labour reserve. The matches’ poor elasticity with respect to jobseekers also indicates little sensitivity to the labour market’s degree of tightness and a limited impact on the firms congestion effect. The elasticity with respect to the jobseekers increases with the level of education (0.1 from primary to higher education), thereby attesting to the workforce’s sensitivity to the matching process, which increases with the level of education. Given the small variations in the elasticities for the jobseekers and job vacancies throughout the skill segments, they can be considered to be constant for these segments and equivalent to those of the entire Brussels Region (all segments combined) in the model. Estimating Equation A.4 in the mismatch model for all the skill segments i will enable us to obtain the values of the residual parameters of tightness ηi. Similarly, estimating Equation A.7.b in the job competition model for all the skill segments i will enable us to obtain the values of the residual parameters of spill-over γi. 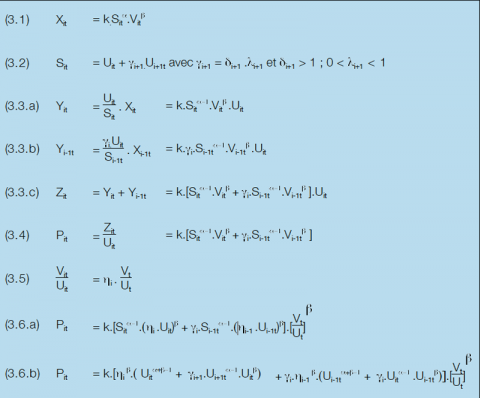 By introducing the values of these parameters as starting values in Equation 3.6.b of the complete model (Table 3.1), we can simultaneously estimate, by full information maximum likelihood estimation, all of the parameters in this equation. 1 Unfortunately, qualifications based on experience acquired in the course of one’s career cannot be taken into account for lack of a way to quantify them easily. This adds some bias to the study. Moreover, this bias increases with the increasing age bracket of the workers being studied. The approximation will be considered satisfactory for young workers just embarking on their career pathways. 2 Matching functions are exchange mechanisms between employers who create job vacancies requiring a specific skill level and jobseekers who have a level of training that is likely to provide the best possible match with the required skill level. These mechanisms determine the number of workers hired at a given point of time, X, in terms of the number of workers searching for jobs, S, and the number of job vacancies, V.
3 So as not to complicate this presentation of the theory unnecessarily, this example will be limited to the segment immediately below the one that generally accounts for more than 75% of the jobs derived from the higher skill levels. 4 The supply Si will be composed of a number of workers seeking employment in skill segment i composed of the number of unemployed from level i, Ui, and a fraction, λi+1, of the number of unemployed from the higher skill level i+1, Ui+1, expressed in equivalents of skill level i (standardised to 1), δi+1 Ui+1, by multiplying their number, Ui+1, by a relative efficiency parameter δi+1 > 1. 5 Tightness develops in a segment of the labour market when the number of vacant jobs, Vi, that are created in it cannot be filled by the number of available jobseekers, Ui, in this skill segment. The ratio Vi/Ui then represents a tightness coefficient that will be used as a tightness indicator in the model shown in Table 3.1. 6 The reference version does not correspond to the real situation, but considers a fictitious situation with the absence of tightness and spill-overs so as to be able to isolate the effects of mismatches and job competition and then take account of them simultaneously (for their effects are not additive in a non-linear model). 7 The atypical case of the lower secondary level, where the probability of exiting unemployment increases by only 0.33% compared with the reference model’s value, is excluded from the comparison because the skill mismatch and job competition effects, which are anticyclic, largely cancel each other out. 8 The estimation of parameters η and γ of the model makes it possible to determine endogenously the optimal proportions of the two phenomena in the adjustment of the probability of exiting unemployment. 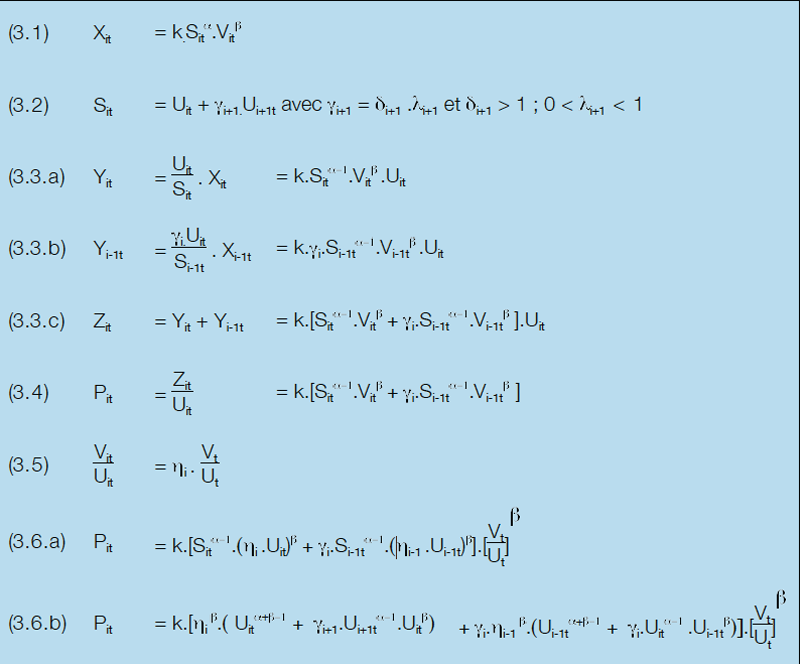 11 The estimations of the separate models for skill mismatch and job competition, in which the spill-over, λi, and tightness, ηi, coefficients are set at 0 and 1, respectively, will make it possible to constitute prior information, the parameters of which can then be introduced, as starting information, into the FIML estimation for the complete model11. The estimations of the parameters for the mismatch and competition models also operate recursively on the basis of a prior estimation of the matching functions by skill level. 12 Elasticity measures the relationship between two variables. Elasticity with respect to the job vacancies shows the incidence of the variation in the number of job vacancies on the number of jobs that are filled. It is measured as follows: The elasticity of the jobs filled with respect to job vacancies = variation in jobs filled (in %) over the variation in the number of job vacancies (in %). Hervé Devillé has a PhD in economics from Brussels Free University (Université libre de Bruxelles ‑ ULB) and is a professor at Catholic University of Lille (Université catholique de Lille), France, where he teaches macroeconomics, economic and environmental policy, and labour economics. He is also a consultant for the European Communities and on secondment with the Ministry of the Brussels-Capital Region. He is the author of a number of publications on the labour market.